Top 6 best science apps for iPhone and iPad that should never miss in your personal collection. Are you a college student? Do you consider yourself a lover of science? Want to become a scientist? Then you should download some free apps related to the field of science in your iOS devices. The App Store is also home to many scientific applications, but what are the recommended? Here is a list of the best science apps for iPhone. Top free science apps for iOS devices. Do you want to stay up to date on the latest science news? Download the app Science Daily that allows you to read the latest news from the most important scientific news portals. This app will help you gain tremendous scientific knowledge. Gather all the science news and impress your friends. A true lover of science can not miss the Quick periodic table of the elements on a device. Teachers and students of Science will find this app useful in supporting science education in the classroom and practicing on the go. Another great free iPhone app for science lovers that is appreciated by users. The app alchemy was based on a variety of disciplines, such as chemistry, physics and astrology. This app allows you to take possession of the four basic elements: Fire, Water, Earth and Air to give rise to new items (up to 300). You can create a simple beer, a terrifying vampire … or a life! Amazing… isn’t it? Star Chart is a great app for all fans of astronomy. If you want to observe the sky and learn more about astronomy, Star Chart is the ideal application. With this app you can find the stars and constellations without having any difficulty. 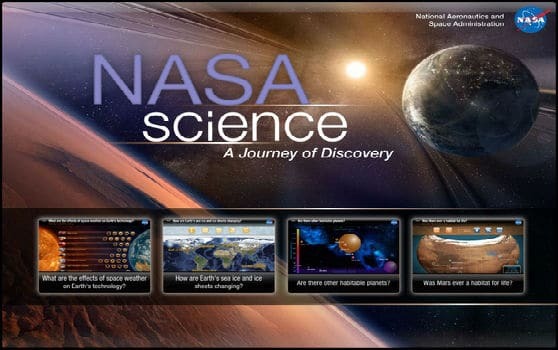 This is the official NASA app to explore images, videos and information about missions. Also NASA TV Live and other interesting features to use. PhotoMath is a very simple app that allows you to perform complex equations and operations and real-time math automatically with your iOS device. These are some of the best Science apps for iPhone free. Unfortunately we can not include all the applications related to science, since there are thousands of them available at App Store. But you can help us complete this collection. What are the scientific applications that can not miss in your iPhone or iPad? Share them in the comment section and help us to make this list complete. Thank you.